In this post, we take a look at online fraud statistics and do a quick walkthrough of the Fraud Filter app by Shopify. Online fraud can have a big impact on small or growing stores. In 2015, fraud cost online retailers almost 1.47% of their revenue, according to a report by Internet Retailer. Online fraud grew almost 32% in 2015 compared to 2014. As more transactions occur online and more online stores appear, this number is expected to grow. There are also certain factors that raise the risk of fraudulent transactions. For example, if you sell internationally, there is almost twice as much risk of fraud compared to selling within North America. The free Fraud Filter app by Shopify is a simple solution to prevent checkout fraud. 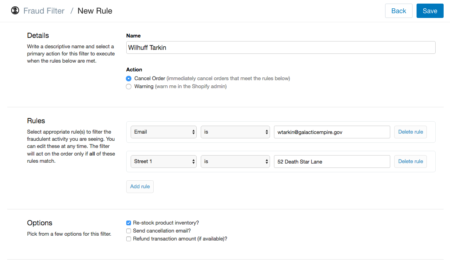 You can assign a number of rules for which orders are either cancelled immediately, or are flagged for your review. Billing and shipping address – street, city, state, country code, state code, phone, etc. For example, if you get fraudulent transactions from one specific domain, you can select “email” “is” for one address, or “email” “ends with” the @domain.com for all emails from that domain. 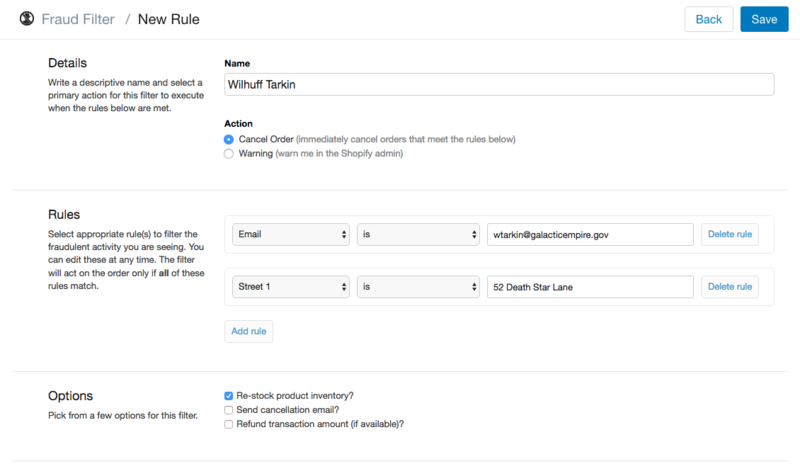 For one set of filters, you can set a number of different rules that capture transactions related to that filter. The app also allows you to restock the inventory from fraudulent transactions, send a cancellation email, and refund the transaction amount if it is available. The app keeps a log of all potentially fraudulent orders so you can review patterns for further protection. In addition, the app creates a notification in the Risk Analysis section of the order. There can be a big cost of credit card fraud for your store as your store grows in scale. Certain factors can also increase the risk of fraudulent transactions. In such cases, you can use Shopify’s Fraud Filter app to manually assign rules for detecting fraudulent transactions, and flagging or cancelling those orders. As you see more fraudulent transactions and patterns, you can keep adding to the list of rules. In this way, the app will capture a growing number of such transactions and you can focus your time on selling instead of on chargebacks. Learn more about the app in the official Shopify Manual.